What is the Tire Valve? Tire valve tire valve and exhaust valve is used as an interface to expand and keep the air does not leak the charge; and a device used to check the tire pressure. Valve can be divided into two categories: one is metal, the body is brass; one for the pad, the main rubber metal. Internal body equipped with the same job as a one-way valve, the compressed air can be filled into the tube, you can not freely leak inside. Bonnet also be used wrench, tighten the screws into the valve body. 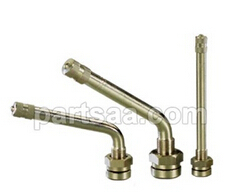 Metal valve stem having a bridge-shaped pad and compression nut, and tube combination to improve the robustness. Valve shape has two curved, straight pipes, fittings valves, only for flat-wheel vehicles. When the twins, do not use the elbow to remove the outer tire pneumatic valve block meconium gear.